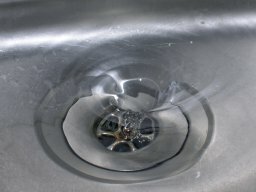 Does the water really spiral one way (counter-clockwise) down the plug-hole of a bath in the Northern Hemisphere and the other way in the South? Folk wisdom has always suggested that it might be so. But has anyone bothered to check – scientifically, that is? The question of which way the water whirls might not be so easy to settle. Complicating factors are evidently at work. Is the bath precisely level and symmetric? Unlikely. And, more seriously, to what extent are the contents of the bath, and hence the vortex, disturbed by the egress of the recent occupant? Naive theory holds that the water should swirl in the opposite sense in the two hemispheres because of the Coriolis effect. This is best understood by thinking about a pirouetting ice skater. The more she pulls in her arms, the faster she spins. An axiom of physics, the law of conservation of angular momentum, tries to keep the hands turning at the same speed when close to the body as when outstretched. A similar thing happens when you travel north or south from the equator on the spinning Earth; nature strives to maintain your eastward speed as you leave the large equatorial circle (outstretched arms) and move to smaller orbits (arms pulled in). Consequently, all things heading away from the equator receive a small eastward nudge, while objects moving toward the equator are pulled westward. Strange effects can ensue. For instance, if a cannonball were fired from the equator at a target exactly north of it, the ball would be moving at 1,000 miles per hour (as would be the cannon and everything else on the equator) when it left the cannon's mouth. Its target to the north would be moving eastward more slowly, however, and so the ball would land to the east of its intended mark. The Coriolis effect complicates the navigation of high speed planes and missiles and has a decisive influence on the circulation patterns of oceans and winds. But what about the water in a bath tub? Just before it disappears over the edge of the drain, the water heading toward the equator is nudged to the west and the water approaching from the other side of the plug-hole, moving away from the equator, is pushed to the east. The result: a Coriolis tendency for the water in, say, Newcastle, England, to spiral counter-clockwise and in Newcastle, Australia, to spin the other way. But it is a very, very small tendency. And, in practice, commonsense insists it must be completely masked by other factors, such as the random disturbances caused by getting out of the bath and pulling the plug, or the geometry of the bath. Casual observation confirms this and it is not unusual to see the water reverse its direction of rotation even during a single outflow. The fact is, the water in an ordinary bath-tub, sloshing about with all manner of currents, hasn't a chance of showing an effect that really only comes into its own over large differences of latitude. And yet, under strict laboratory conditions the Coriolis effect can be detected. Experiments carried out, appropriately enough in Watertown, Massachusetts, in Cambridge, England, and in Sydney, Australia, and reported among others in the journal Nature, all gave positive results. The Australian team concluded: "We have acquired confidence in the hypothesis that carefully performed experiments on liquid drainage from a tank will show clockwise rotation, if done in the South Hemisphere."